As a Boston resident, I was lucky enough to encounter what was dubbed “the Blizzard of 2015”. I used to FREAK OUT about snow when I first moved to Boston, but after years of seeing how the media likes to make everything bigger than it seems, I quickly got over it. If you move to New England, you are making a conscious choice to endure some cold weather and snow on occasion. I had the luxury of working at home today which was great – I didn’t have to worry about trekking to the office downtown and I felt like I got a lot done (professionally and personally). 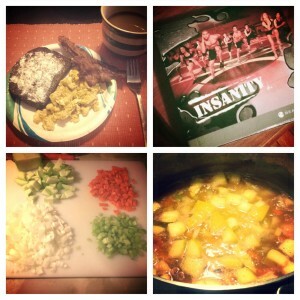 I woke up at my normal time today to fit in time to do one of my Insanity DVD’s. I’ve moved up to “Level 2” in the DVD series which is accomplishment in itself – they are an hour long and involve a lot of calisthenics. I love Shaun T, especially on days when I have no motivation to get off the couch. His vibe is encouraging and positive which helps me get through 60 minutes of PAIN. I think my husband hit his head last night (I’m partly kidding), because after working out, he made me a full breakfast of bacon, eggs, and toast. Since I’m the one who loves to cook in this house, it was nice to not have to worry about a meal as well as enjoy a healthy breakfast. After settling in at my home desk for the day and getting all of my fun advertising things done, I did a “run through” of a soup recipe. I am competing in a soup “contest” at work on Friday…yes I may be crazy for doing a run through of a recipe but I wanted to make sure I got it right and could make any tweaks before the big event. I’d be utterly embarrassed if I messed up soup….and especially since I talk about how I love to cook all the time. Overall it came out well but going to make some minor adjustments – I want to WIN 🙂 I will post the recipe after the event happens – it’s one of my FAVORITES!!! For those of you who were in Juno’s path, what did you do today?